There's A Lot Of 21 Chromosomes (And A Lot Of Love) In Our House Tonight! You are here: Home / Resources / There’s A Lot Of 21 Chromosomes (And A Lot Of Love) In Our House Tonight! There’s A Lot Of 21 Chromosomes (And A Lot Of Love) In Our House Tonight! Tonight we hosted a monthly get together at our house for local families raising children with Down syndrome. It was a ton of fun, and we had a great time meeting so many wonderful families. It’s such a blessing to be on this journey with so many parents who are winning when it comes to raising their children. I love hearing their stories, getting to know them more, learning from them, etc; but what I love most is watching them love on their children. Tonight we had a house full of parents that are madly, wildly, crazy, head over heels in love with their children. It’s a beautiful thing. Tonight our house was full of beautiful children, lots of love, amazing parents, an abundance of 21st chromosomes, and not one ounce of sorry. What type of support network or local interaction with other families do you have in your area? What are some of the ways you connect with other families who are on the same journey as you? I checked out your blog; how old are your “little” ones? This is great , , what a great picture love it. My little sister has Downs and has been the biggest blessing in my life for the past 16 1/2 years (yikes!). She’s so beautiful, just like all these lovely little kiddos. I only wish my parents and my family had little support community like this when she was little. My family lives in a suburb of Detroit. I wish I could bring Sarah (my sister) and come to Texas to give all these little beauties a hug 🙂 My heart just melts when i meet a new Downs friend. I’m actually in the process of starting a blog about Sarah and Down Syndrome in general just to help share the love. Oh my goodness, I can’t stand it…I want to BE THERE!!!!! Just think of the LOVE flowing out of those precious little ones! ♥x1000! @897159c7171c2cea405d3973076fb7af:disqus Thanks for the kind words, we are are just trying to love on others the best way we know how. The great thing about where we live is how great the parents are. Everyone really enjoys being involved, and helping their families connect with other families. What sort of local events do you guys have where you are from? I would imagine a large city like Chicago would have some pretty great resources? I love that y’all are not content with the online community, but that you’re willing to Skype, meet, and even have parties! I don’t know anyone around here who is James’s age, just a 6-yr-old and a 19-yr-old. Hope Landing, where James receives therapy, has occasional get-togethers for all families of kids with special needs, and those are fun. We need to skype with you all soon by the way. We are from Denmark and here there is not more than about 21 yearly who is born with down syndrome. Lots of people gets abortion when they find out they are expecting a child with downs. @80af36f74a4bbadf03e88b09f8752ace:disqus So very nice to “meet” you. What yo describe breaks my heart. I hope that the world can learn just how great children like these are. It sounds like you are doing a great job! What types of therapy is your little one involved in where you guys are from? Thank you for this story and picture. I needed to see it..I’ve been very disturbed. Earlier today I read the news article about the couple who won 3 million dollars for a Wrongful birth of their daughter with Down Syndrome. Saddens me greatly that that little girl will never know that kind of love and acceptance from her parents. Hopefully one day she will realize that her Heavenly father (who made no mistake in forming her in the womb) loves her very much..JUST the way he made her. @facebook-798090299:disqus Thank you for the kind words, I read that story also and it breaks my heart. I have no idea how her parents are going to explain to their daughter one day why they are millionaires. Good thing you bought that house!!! Lot of room for all those beauties!!!! Thanks for the kind words, we had a ton of fun. 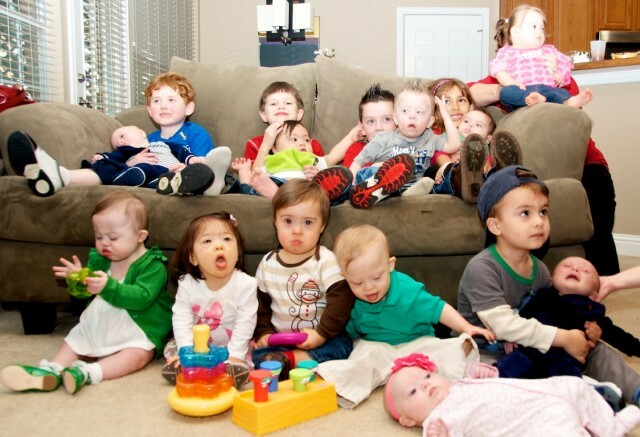 Also we have a great local Down syndrome support group (Down Syndrome Guild of Dallas) but we wanted to do something a bit more regular, so some of the moms just decided to plan a monthly meet up. It was a great idea, this was our 2nd month in a row to do it, and the turn out has been great. Darling children, and it looks like a lot of older siblings to help out as well. I love what you do. It is so inspiring, and living near Portland, OR I need some inspiration! That was a major collection of adorable! I think I am on cute overload, but I love it. You mention interaction with other parents…this is my major struggle, since my girls don’t have a diagnosis it is really hard to find other parents who are on this journey. We have some of the same charactoristics as kids with down’s and some like kids on the autism spectrum, there isn’t one group that matches my girls. So it’s always been a little difficult to connect. This has gotten worse as the girls have gotten older. It seems most of the web sites are geared towards infants to early elemetary. I have one facebook friend that has an adult daughter with both physical and cognitive disabilities, but that’s it. I would truly welcome more interaction, but where? That is a whole lot of cuteness. We would love to join you guys next time. but she doesn’t look like down syndrome child … her strength and her activities is like a normal child really i cant believe that because the report says that she is living with down syndrome … if you look at her u may accurate her eyes then u can feel that she is down syndrome … so I wanna ask you that her face will change or not ? I don’t have any problem that if she has down or not because i can treat with her..but you may know that society is a big problem …. This picture makes my heart happy. It also makes me laugh out loud. Life with little ones is a lot of fun. This picture brought tears to my eyes. I am missing by wonderful Down brother so much, and its almost a year since I lost him. My biggest goal when I retire is to find someplace where I can volunteer with Down children.